They may be tweaked a bit in the future. Description:This is a friendly group with mixed levels of ability who like to play tennis. You are welcome to join us. You don't have to bring a partner - just show up. The cost is $1 for members or $10 for non members. After each set, the winners move up and losers move down. When you change courts you change partners. You will play 3 or 4 sets during the evening. When: Sunday, February 11th 11:30-3:30. This year's social was a lot of fun - thanks to all who attended! 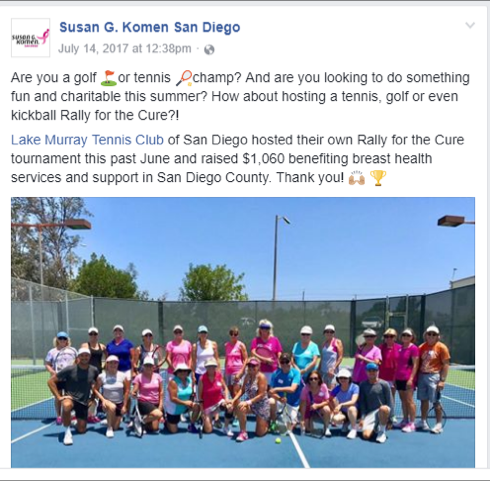 Description: Our annual Rally for the Cure is being held at Lake Murray Tennis Club. It is $20 to the Rally for the Cure and $5 to Lake Murray for balls, etc. Each person is asked to bring one item for our salad bar or dessert bar, and they will receive a gift bag from the Rally as well as a fun day of tennis, round robin doubles style! Thanks to all who participated in the 2017 Rally! Contact: Debi Adcock (619)-226-9091 or the front desk for questions, or sign up at the club house! Description:Avid tennis players know that there is a competitive advantage to being tournament match ready. The tournament tennis experience improves a players ability to compete in all other areas of tennis competition such as league and social tennis. The Coachella Valley Grand Prix/EMMO TENNIS is a series of adult doubles tennis tournaments. Players individually accumulate points at each event they play, which establishes a computer ranking amongst other participating local players in all NTRP divisions from 3.0 to 6.0 (Open) for Men's, Women's, and Mixed Doubles. Players compete throughout the year to earn the privilege to play against their fellow top point leaders from the Orange County, San Diego, and the South Bay Los Angeles Grand Prix sections at the Masters Grand Prix invitational in the Palm Springs area. Sign up now for the Emmo Tennis Grand Prix on Friday August 10th (evening play only if needed), Saturday, August 11th, and Finals Sunday, August 12th. Men's Women's, and Mixed Doubles of all levels. We can find a partner for you if needed. And we can usually work around time conflicts if you let us know on entry. Winners will advance to the Master's Grand Prix in Palm Desert! Entries are due August 1st. Leave entry and check or cash at front desk. Note** All courts will be reserved all day on Saturday and Sunday. Description : All divisions 3.0-4.5 Mens and Womens Singles. Players will play a round robin format. One match to be played every two weeks. The top four set winners will play a semi-final match in January. $10 per player in addition to furnishing match ball for half of the matches.